Rent a buggy for this summer 2016 to explore any hidden sightseeing and natural landscape in Milos such as Sarakiniko, Kleftiko beaches, catacombs, Pollonia and Plaka traditional villages, the healing springs and much more secret paradises of this marvelous Cycladic island of Aegean Sea. Cheap buggies well maintained and newly are available from our Rent a Car branch office in Milos just to give you the opportunity to explore the island, especially for those who are families, groups and couples! 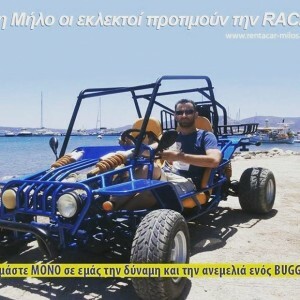 Buggy car rental is cheaper, more recreational and alternative holidays suggestion than renting a jeep or a 4×4 car hire in Milos; furthermore it is also safe and strong with a petrol engine of 260cc and priceless (starting from 22 euro) to rent a buggy in a daily basis or much cheaper for any long term periods. 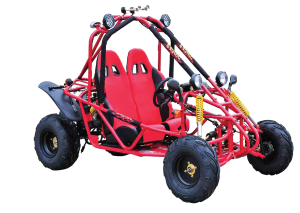 ATV buggy rentals are one more cheap suggestion from our buggies car fleet available options as they are little shorter than buggies and seems more likely the 4 wheels drive motorbikes. Find out your preferred one buggy in our car rental online booking engine and pick it up anywhere in the island with a special discount, deal and last minute offer only from our company… Rent a buggy in Milos from RAC SA, Trust us!